Event Details: Organised by Dirt Running, the Dirt Half Challenge starts in Leighton Buzzard and follows the canal towpath north to Stoke Hammond, climbs through beautiful countryside to Great Brickhill, then passes through the scenic Stockgrove Country Park before following the Greensand ridge back to the start via the canal towpath. 2016 saw the 7th staging of this sell out trail half marathon. Before the race:Sitting in the car, waiting for everyone to arrive at BLC, while the rain pounded down on the car, thoughts of, ‘what are we doing?’, were prominent. After what seemed quite a scenic route to Leighton Buzzard, directed by the Satnav, nothing to do with me, the rain had eased and we gathered in the hall to wait for the start, we met up with Andrew and his Dad. After a warm up and observing a minutes silence we were ready to start. The race: The race started off with a lap of the playing field, after a moment of nobody wanting to lead the group out we settled into a good pace, three guys set off quickly and were soon well ahead, I ran at the back of the second group of four people. Setting out down the canal path we soon turned over a bridge and ran in the opposite direction on the other side of the canal, after a quick wave to the other BDRC runners on the opposite side I got into a steady rhythm. We caught up and passed third place, with first and second well in the distance. After 6 miles we headed away from the towpath and up a steep sandy hill, this was the first bit of off road and was great, here I managed to move into third place, at the top of the hill I realised that I was only with one other guy and we had dropped the other two. Then there was a shout of, “Come on John” I looked up to see ET, having support on the course was great and really appreciated. After a short bit on the road we went off road again and ran through some beautiful wooded areas. I kept getting glimpses of second place and knew that we were catching him. After crossing a road we headed up a few steps to continue running through the woods and this was a bit more undulating and was great fun to run through, I managed to drop the guy who was with me, who ended up finishing in third place. Coming out of the woods I was with the second place guy, we ran together over a couple of slippery wooden bridges, and then I past him at 10 miles. I could see the first place guy up in front and tried to push as hard as I could through the soggy grass area we were in. After joining the towpath I knew that I had caught him quite a bit but was expecting him to pick up his pace along the flat towpath. With two miles to go I had caught him, we ran shoulder to shoulder for the next mile, he put in a few surges that I was able to stay with, it was the first time I had been in a real race to the finish and I was loving it, although my legs were screaming at me now. With less than half a mile to go we turned off to go over the bridge to head the opposite way along the towpath, I knew this was near the finish so decided to kick at this point, I made a decent gap and dug in to the finish, coming in 10 seconds in front of him. There was a nice area by the finish that we were able to gather to cheer in the rest of the BDRC runners. Everyone ran brilliantly. Times below are chip times, hence Heidi is in front of Andrew position wise, but not by chip time. 699 people finished the course. Funny Moments: Poor Claire finishing and getting shouted at to run to the hall to watch the presentation. As she came running in she could be heard asking if she was able to stop running now? The chorus of SatNavs on the way home. Would you recommend? Great course, although this year was altered due to a path being closed, so the normal route is ever so slightly different. Beautiful places to run, you were always concentrating on the ground underfoot so it kept you really focussed and was really enjoyable to run across. Well marked course and great atmosphere. Definitely one to do again. 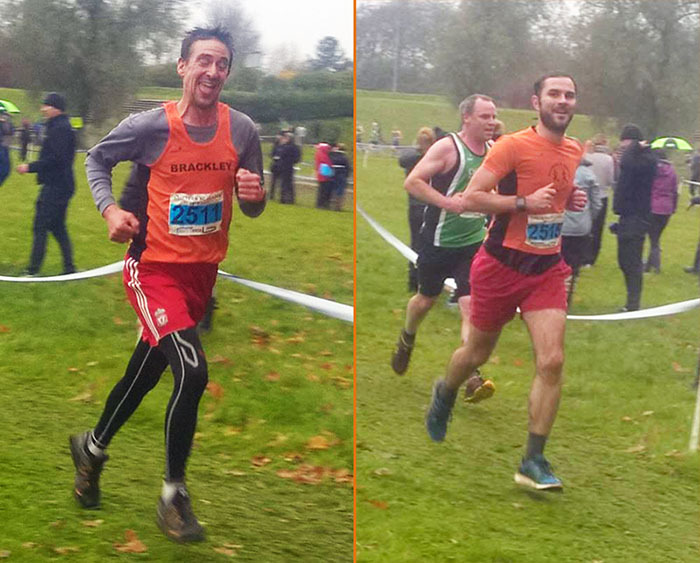 Event Details: Chiltern Cross Country League, race 2 of 5. Flat grassland course with a couple of short but steep hills. Before the race: Tiny Dawn (TD) had dropped off tent & flag and Nicola (Choo Choo) two spare BDRC tops for Maxine and Suzanne. Picked up Maxine and Suzanne from BLC and had incident free journey. Quite a few BDRC’s doing other races and others not able to do this one, so took tent and flag, but not required as we used Banbury Harriers tent to store our bags. Arrived in time and met Sam & Sarah queuing for loos. Maxine and Suzanne joined the queue as I sorted their race numbers on the racetec website. The race: There was a short period of silence before the Senior Men's and Women's races to remember two teenage runners who had tragically lost their lives on the Tuesday. Straight forward race. After my DNF at Race 1 the previous month, took no risks so had calf Skins, lycra longuns and of course, red shorts. As said, no risks, so set out to just enjoy this one. Sam set off in his normal running shoes, taking advantage of lesser muddy areas. After 1½ miles he was concerned about his calf, so said there was no pressure to finish if it got too bad. Shouted out a few times at Barry Cornelius taking pics and enjoyed shout outs from the supporting BDRC ladies and Sue from Silson. That was it really, incident free, but very enjoyable afternoon run. Finished 314 of 457. Sam limped in only a minute or two behind, but his calf was not good and fair play to him for finishing. Funny Moments: Suzanne mentioning her race number whilst driving out of Brackley, which reminded me I hadn’t got race numbers… nearly a big Nozup, but avoided. Went for high five on first big lap with the BDRC gal support, but they were busy taking pics and thought I would be high fiving thin air. Fortunately Sarah stuck her hand out just in time. Would you recommend? All enjoyed and were looking forward to Race 3, so defo yes. Event Details: Hosted by Chiltern Cross Country League. There were several races run throughout the day catering from Under 11’s to the Senior Ladies and Men’s races. Before the race: Being my first cross country race I didn’t really know what to expect but going there Chris (Noz) and Suzanne put me at ease and started the day with a smile. The sign posting for the car park wasn’t the best but after a short stroll and a couple quick chats with fellow runners we managed to find our way to the start. A lot of people attending, both running and supporting. Stalls selling running gear and a hot food van  (big thanks to Suzanne for the bacon butty and coffee that went down a treat after the race) Lots of toilets too which luckily didn’t have a very long queue. The race: The race started with a minute silence out of respect for Stacey Burrows and Lucy Pygott who were tragically killed while out training. The course was well laid out and easy to follow. Plenty of marshals’ on hand giving lots of encouragement. The ladies race got very lucky with the weather as it only started to rain as we were finishing so the ground was still good to run on. A few soggy sections but these were navigated easily. The course wound its way through the park and the scenery along the way was lovely which added to the atmosphere of the run. It is predominantly flat but as the course write up states, there are 2 very steep hills! They are however very short so not too daunting although I personally didn’t manage to run up them and could’ve done with a chair lift lol. The course was well prepared with branches and other debris moved out of the way. On the whole it is a lovely course to run, and a great day had by all. Lots of encouragement from other teams and good support for everyone at the finish line. Funny Moments: Seeing a post on FB later that day from ChairBow asking whose undies had been left on the Banbury Harriers tent and wondering what on earth Noz had been up to while we were out running! lol. Would you recommend? I would definitely do this race again and would recommend it to anyone who enjoys cross country. Event Details: The race is organised by Oxford City Athletics Club and has been a regular event since at least 1995. The race is cheap to enter (£8 in advance), but consequently no medal, T shirt or goody bag – which is good or bad depending on your perspective! 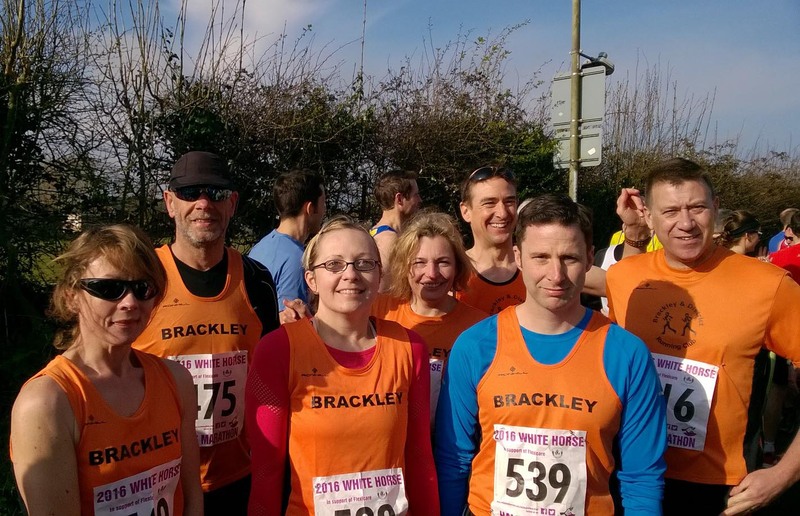 Before the race: The race attracted large teams from clubs across Oxfordshire including Abingdon, Witney, Headington, Woodstock, Kidlington and White Horse Harriers. We tried to make the two person BDRC team look large and clearly succeeded to some extent as after the race we were asked if we had brought a minibus down from Brackley! The race: The race started from East Hanney Village Hall and Tash was out of sight after a quarter of a mile. The route is predominantly on fairly level country roads which were quiet and well marshalled. Although it was sunny all the way round, there was a chill in the air making for a comfortable temperature to run in. As we came back into the village I could see the Brackley orange of Tash ahead and thought I must have speeded up over the last mile, but in fact the only reason I narrowed the gap was because she had had to stop to redo her laces. The final 200 yards is a loop around the cricket pitch and into the funnel where the race was manually timed. Richard McMahon 135th – 41:51. 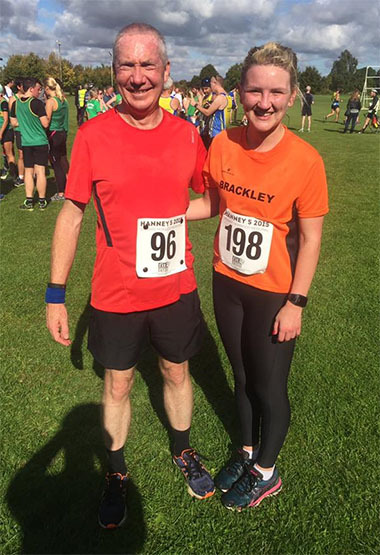 Funny Moments: Tash used the postcode from the website to navigate her way to the race; and ended up outside the organiser’s house twenty minutes away in Oxford!! Would you recommend? A cheap, flat, well organised race which was good for newer runners, but with lots of clubs there providing good competition for the more experienced racers. Some events are designed to be fast and competitive and encourage runners to chase their PBs in that distance. Other events celebrate the simple pleasure of running itself. 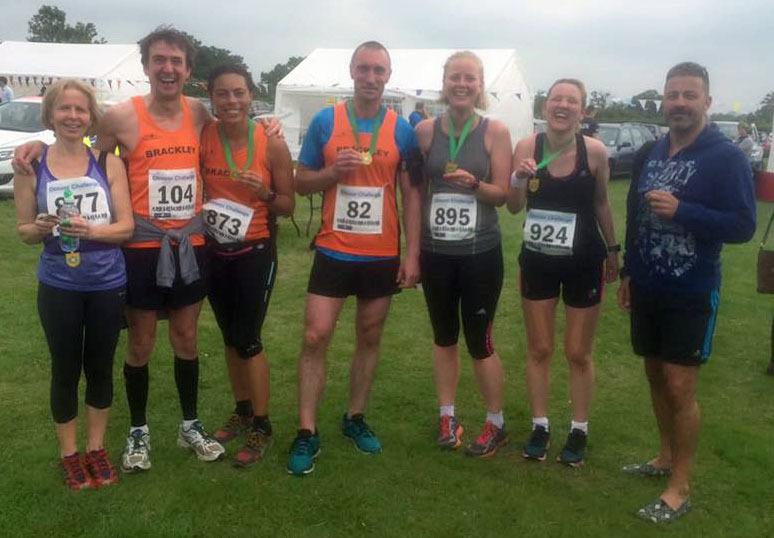 The range of runs organised by the Adderbury Running Club on Sunday 10th July 2016 fell firmly into the latter category. As they were all deliberately off-road races speed was not the number one priority! The events ranged from junior races and a 5k fun run through to a half-marathon distance. As a relatively inexperienced off-road runner, and with half an eye on the weather forecast, I had opted for the 10k run. All events started and finished at the playing field in the heart of the village and the area was very well organised with toilets, changing rooms and even a van selling bacon butties! Parking was in another field a short distance away but all the local residents were happy to offer directions to the start point. Having collected my race number from the organisers I watched the half-marathoners set off before getting ready for the 10k run. The route took us a short distance through the village, encouraged by a few slightly bemused locals, before we were out into the surrounding countryside. There were some footpaths to follow but for most of the course we skirted arable fields or crossed pasture land. There were plenty of hills, enough to make it a challenge, but not so many as to detract from what was a really beautiful course. There were also stiles, gates and a couple of huge badger setts to navigate as we went around adding to the rural nature of the event. From Adderbury we went north to the edge of Bodicote before winding our way back through the idyllic Oxfordshire countryside towards the finish point. I only have one quibble about the whole thing. At one point in the second half of the race we came to a cross-road which had neither a sign or a marshal to indicate the way. Needless to say, myself and a few others went the wrong way! Luckily after a few hundred metres we were called back by an Adderbury Running Club member who was also running the race and knew the route but I would rather have not had the little detour! We finished to the welcome of the participants of the junior races and were given a nice little medal for our efforts. Overall it was a lovely, relaxed and family friendly event. I was surprised at how few people actually participated in the various races but the running club can be proud of the event they put on. Before race: Picked up Tash & Froggers, supposedly from BLC, but they were bimbling up Pavillions. We arrived in plenty of time, collected race numbers then looked around the fete and met with the others as they arrived. Who ran: Race is well established and attracts a quality field of runners, including Bartek, Rachel Prior, Tessa, Froggers, Tash, Paul Froggat and Nozzer (me), from the mighty BDRC :-) Was also good to see some old familiar faces from other clubs. After Race: No trophies for BDRC, but we all knew we'd done a tough race and I'm sure felt a good sense of achievement. Recommend: Yes, very friendly event with extra bits going on. If you don't like multi-terrain or have any niggly injuries at the time, it's defo not for you. May bank holiday, sunny day, picturesque village, pub on the green….oh and good company. The Thornborough 5 mile (10mile is a double loop) is a lovely little village race with both club and non-club runners, local families and dogs taking part. It was well supported with water stations almost at each mile. It is definitely an undulating course and was a challenge to complete with a few uphill climbs and head winds. With it being a couple of weeks before the Hilly 100 it served as good Hilly practise. Gareth came third in the 10mile race in 68:45, with myself(40:34), Chris(33:48) and Ian(36:14) completing the 5 mile race, we then enjoyed a few drinks on the green and burger off of the BBQ. I’m not really a bank holiday person but as a family we had a nice morning out attending this event. Seven BDRC members embarked on this race. I went into this race with the hope of getting a half marathon PB. As planned, Graham ran the whole race with me, which was fantastic as when my legs were feeling a little wobbly or I was finding it hard (a nice hump back bridge to go over twice)he encouraged me to keep going and not slow down. The rural road race along country lanes, organised by White Horse Harriers, started and finished in Grove. The race was won by Paul Fernandez from Abingdon, who has won the race for the last four years. 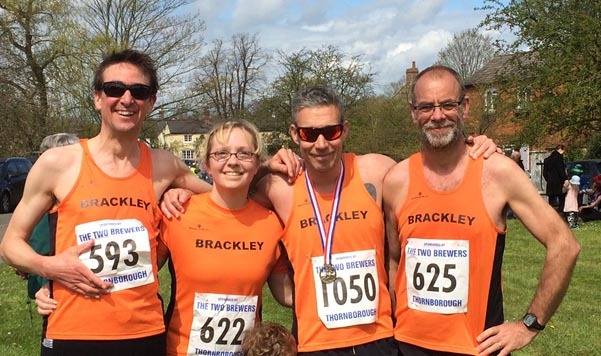 First home for Brackley was Chris in 1:30:44, followed by Ian in 1:34:08. First lady was Dawn in 1:41:06. Graham let me cross the finish line just ahead of him finishing in 1:50:15 and 1:50:16. Next home was Nicola in 1:57:02 and completing the pack was ET in 2:17:11. I’m pleased to say I got my PB and look forward to doing this race again in 2017. I told one of my mummy friends, I had a lovely mother’s day, I got a couple of hours to myself to go round Milton Keynes. She was slightly taken a back when I explained it was 13.1 miles round MK and involved no shops! 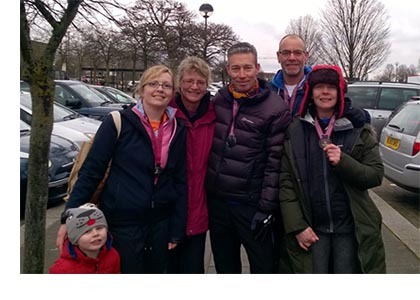 I remember doing the MK festival of running in 2014, I enjoyed the laughs in the queue for the loo beforehand and remember being so pleased to see familiar faces at the finish line as everyone who had finished before me had waited to cheer me in. This year the event was bigger with a greater variety of distances. Also all races were subsidised for club members so there was a really good club turnout. Julie and I were booked into the half marathon, which was the final race to start. This was great as it meant we were able to cheer on all the other club members at the start of their races. 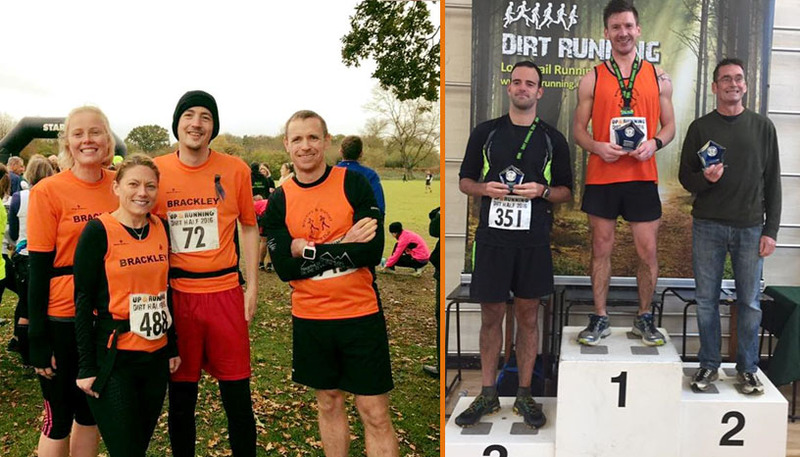 We were pleased to see so many new club members competing in their first club championship races and other members pushing themselves for new distances in preparation for spring marathons. We did have a moment of panic at the start of the 5k race, as women with buggies and small children ran past us and Chris Nobel was not in sight, however an orange flash soon zoomed past us and later explained that he had had problems getting to the start line. 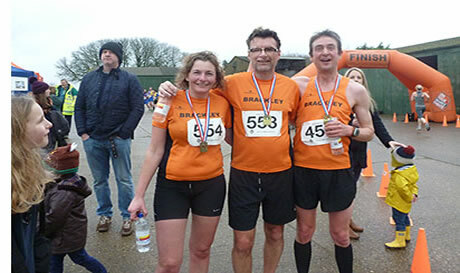 So having seen all other Brackley runners start their races, it was time for the half marathon start. At the start line I saw some guys wearing last year’s chicken run t-shirt so took the opportunity to promote our own club race- nothing like psychologically preparing for a race! I personally find the half marathon route a really enjoyable one (at least the first half) as you get to see some pretty areas of MK that you wouldn’t normally see. The support from the community in old MK is really good with sweets, cowbells and cheers. You get to take in Willen Lake, which is an ideal venue for families to support from and again you get a lot of support running through this area. This year, having done this race before, I was prepared for the hills. Non-runners have told me that Milton Keynes is 100% flat- I can confirm it is not! Going through a number of subways you encounter a few inclines, and the last mile sees you climb up to the Pyramid in Campbell Park, which is a bit of a killer. But this is compensated with the crowd that greet you as you turn towards the finish line outside the Xscape building. This year I was pleased not only to be greeted by familiar faces, but also cheer in other runners after my race. With so many runners from the club, I would fear missing someone out if I listed results. However I was pleased to compete it in 1:55:07, 8mins18seconds quicker than in 2014. If you fancy a bigger race, with support along the route and a good atmosphere at the end, this is just on our door step so an ideal one to do. 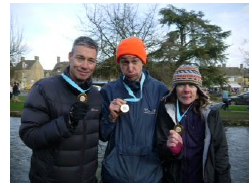 On a gloriously sunny Valentine’s day Dawn Breward, Chris Noble and myself made our way over to the picturesque village of Lower Slaughter in the Cotswolds to take part in the inaugural Valentine 10k. We arrived in good time thanks to the expert navigation on hand ;-) and even had time to take in some of the local historical sights before heading off to race HQ. After picking up our numbers, commandeering one of the changing rooms for our own use and performing the usual necessaries we headed up the hill to the start, hoping we would not have to run up it in the race but knowing we probably would. The first three miles of the race were downhill overall and it wasn’t too difficult to keep up a reasonable pace, however the 4th mile was mainly uphill and I started to catch the 3rd placed runner on a long uphill section that features in the Hilly 100 although in the opposite direction. At the top of the rise I had narrowed the gap from about 60m to just under 10m. The 5th mile was all downhill and the pace was over a minute a mile quicker than the previous mile. The 3rd placed chap held me off until we hit a couple of sharp little inclines where I put in a burst and went past him with a little over a mile to go. I dug a bit deeper to make it stick and could see that the second placed guy, who had been out of sight, was beginning to tire. I chipped away at his lead and could sense that the now 4th placed chap had dropped back now. I closed the gap on the 2nd placed runner but could not catch him and finished in 3rd place in 38.22 which I was very pleased with. Chris ‘Nozzer’ Noble rolled in shortly afterwards in 5th place (40.55) and Dawn Breward finished in 13th place overall and was 2nd lady (45.23) despite suffering badly from the lady lurgy and nearly coughing up a lung at the finish line. Definitely a lovely little race and a nice addition to the club’s race fixtures. Both Dawn and myself won prizes (probably speedboats , however to save them postage we asked them to distribute them locally ). The Gayton 5/10k was the second race on the BDRC Championship race calendar, so decided to get my arse into gear and give the 10k a go. Obviously Nicola, Ade (5k) & Toby (10k) thought the same thing. The Crooksey's had to go before the presentations, so Toby had the honour of collecting Nic's 1st Female trophy, but they didn't call out Ade's name for his age cat trophy. Organisers had messed up, but he sorted it the next day. Was sure I'd won the V50, but some geezer did 38 mins! Leaving the snow of Brackley behind us, myself, Dawn, Gareth and Ian headed over to Stratford upon Avon for the first championship race of the year, Not the Roman 9. This was my first time of doing the race and my first club championship race. Stratford was a bit warmer than Brackley and a lot less white. The race had reached its maximum numbers of 800 and I would say most of the 800 had braved the weather. 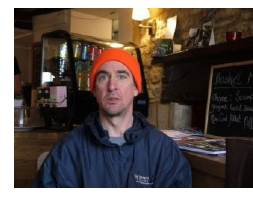 The route, which started and finished at the NFU social club in Tiddington, went through the picturesque village of Loxley where there was plenty of local support. It was well marshalled and an all round enjoyable morning. First home was Gareth (48:39), followed by Dawn (53:10) closely followed by Ian (54:03) and then myself (58:36).